Most elegant In-ground salt water Pool home with variable speed pump, multi-deck Spray fountain & waterfall with expanded pool deck patio! Must see! Over 1900 sq. ft. of living! Accordion hurricane shutters in back with roll down shutters in the front! 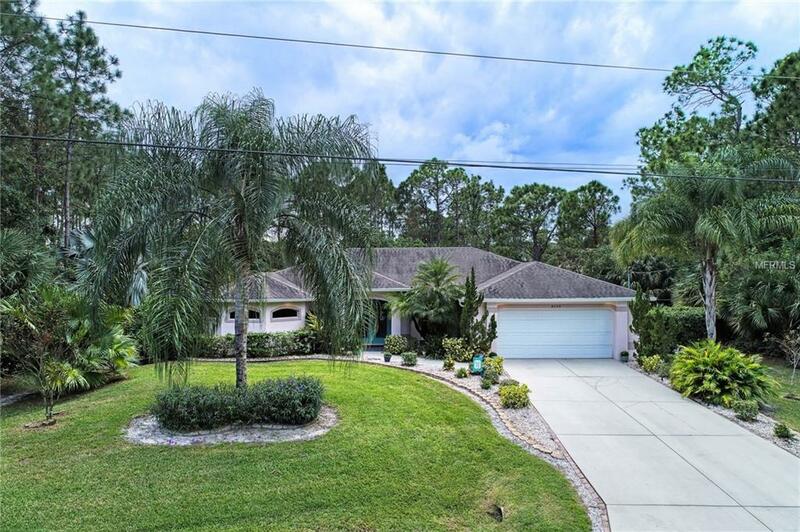 Impressive double door entry with an array of mature palm trees, flowering shrubs with multi colored rock trim with fountain in front of home! This open plan offers 3 bedrooms plus a den with french door entrance! Tall volume ceilings in the main living areas with wood flooring in the Great room. Lighted plant shelving in the formal dining rm! Spacious kitchen offers Crown molding, large granite breakfast bar! (Can fit all the family! ), raised panel cabinetry & additional serving station too. Large utility rm just off the kitchen & 2 spacious guest bedrooms! Master bd. has tray ceilings, recess lighting with access to the pool patio! Built in lighted niche accents with Granite shelving through out the home! Under cabinet lighting too! Master bd. offers dual sinks, walk in tiled shower & luxury garden tub! New a/c 1 year with R/O (water purifier) In kitchen! 3 entries to the pool patio with windows having solar film! Home also includes a security & sprinkler system with lighted fascia around the exterior of home. So many extras to list! Must see! Make your appointment today!